Combine 1/2 cup sugar with the cinnamon in a shallow bowl. Set aside. Line a plate with paper towels. In a small saucepan over medium heat, whisk together the water, 1 1/2 tablespoons sugar, salt and 2 tablespoons vegetable oil. Bring the mixture to a boil then remove it from the heat. Stir in the flour, mixing until it forms a ball. Transfer the dough to a cloth pastry bag or heavy-duty plastic bag fitted with a large star tip. Pipe the dough over the pot of oil to a length of about 4 inches, then using scissors or a sharp knife, cut it so it releases into the oil. (Stand back to avoid any splatters.) Pipe two to three churros into the oil at a time, frying them until they're golden brown and cooked through. Transfer the churros to the paper towel-lined plate to drain for 2 minutes, then roll them in the cinnamon-sugar mixture. Repeat the frying and coating process with the remaining dough. 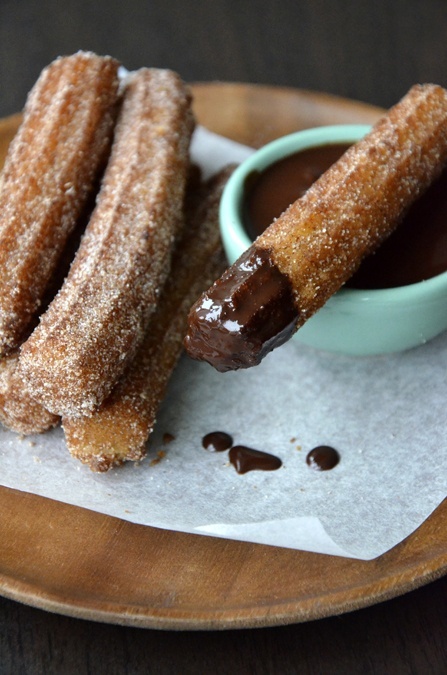 Serve the churros with the warm chocolate sauce (recipe below). Warm the heavy cream in small saucepan. (Do not let it boil.) Pour the heavy cream over the chopped chocolate. Let it sit for 1 minute then stir to combine. It's important to use a cloth or heavy-duty plastic pastry bag, as a regular resealable plastic bag is not thick enough and will split open if you try to pipe the churro dough through it. The chocolate sauce will thicken as it cools, so it's best to make it right before you're ready to serve it with the churros. A pastry tip isn't essential, however using the large star-shaped tip will give the churros the textured lines you see in the photos. This churro recipe can be easily doubled.